A great choice for mobile musicians and podcasters, the AudioBox iOne is USB bus-powered, compatible with Apple iPad, compact, ruggedly built, and works with virtually any Windows, Mac, or iPad recording software. It offers one instrument input and one mic input with high-performance Class A mic preamplifier, balanced TRS monitor outputs, and professional-quality, 24-bit/96 kHz converters. 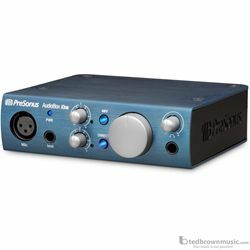 It comes with PreSonus' Studio One Artist DAW software for Mac and Windows and works with free Capture Duo for iPad recording software, with direct wireless transfer of your recordings to Studio One.